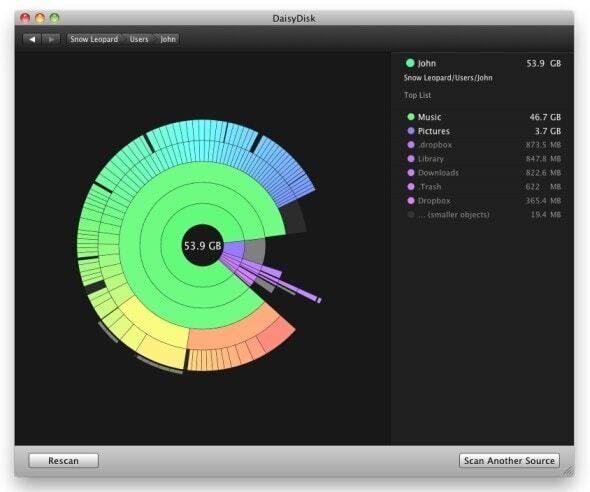 DaisyDisk is a utility for Mac OS X that analyses your hard disk usage on any drive connected to your computer and presents it in an easy to view way. Not only does DaisyDisk show you what’s using up space on your hard drive, but it also makes it easy to remove files that you don’t need by revealing them in the Finder. Your files are displayed using a ‘sunburst’ visualisation, with an accompanying list on the side of the window offering a key to the diagram. The visualisation not only shows where files are taking up most space, but is designed in such a way that the folder hierarchy of your drive is also displayed in a very easy to see way. You can look at as much or as little detail as you want, and it’s clear that a lot of effort has been placed in the design of DaisyDisk. This is crucial, as essentially, it’s still just an application that scans your hard disk for file types, but the care that has been taken in making sure that the application is aesthetically pleasing is second to none, down to the opaqueness of the main window. If you want to find out what’s taking up so much space in a particular folder or section of your drive, you can easily select it in the sidebar and show it in the Finder. If you find a large file you don’t need, you can then simply delete it. In addition to that, you can also preview file content by simply hitting the Space bar on your keyboard. The simplicity of DaisyDisk is so ‘Apple’ in the design, and does the developers great credit, although you’ll have to fork out $19.95 if you want to buy it. 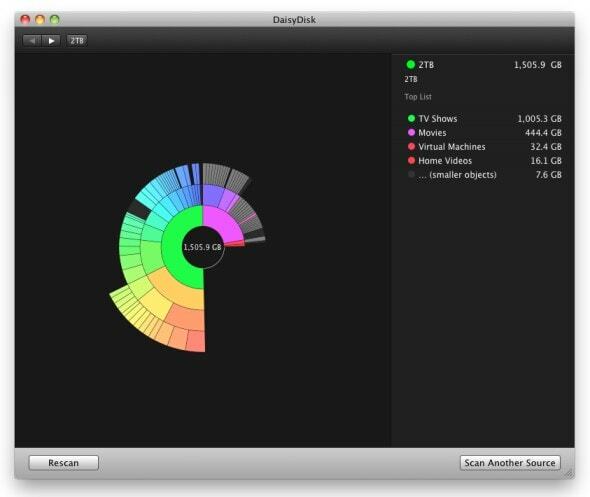 For those looking for an easy to view disk analysis tool for Mac OS X, DaisyDisk is definitely a choice worth considering.